Liverpool Coach Jurgen Klopp has revealed what Mohamed Salah must do to become the World best player on the planet. Salah was at an incredible performance last night when Liverpool take on As Roma in the first leg of their Champions League tie which ended 5-2 in favour of Liverpool. 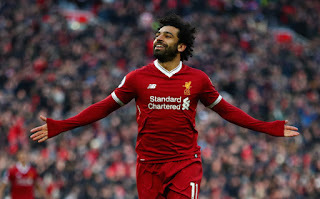 Salah got two goals in the encounter and assited both Sadio Mane and Roberto Firmino goals in an encounter that was mouth watering althrough the 90 minute. "Look, you always create stories. If you think he's the best in the world, write it or say it." "He is in outstanding good shape, world-class shape, that's 100 per cent. That's good. To be the best in the world you need to do that over a longer period I think." "There are few others who are not too bad. He is a fanstatic player. I'm really happy." How high can you rate Mo Salah last night performance?